Corrected transposition of the great arteries is a rare condition and has been estimated to account for 0.5-1.4% of clinically apparent congenital heart disease cases. [1, 2] Of this group, probably fewer than 1% of individuals have no associated abnormalities. In corrected transposition of the great arteries, the left atrium is connected to a right ventricle, from which an aorta arises. Hence, 2 discordant connections occur in sequence. The 4 chambers of the heart have distinct features that identify them regardless of their actual spatial location or connection. Therefore, even if a ventricle is present on the left side, it can be identified as a morphologic right ventricle. The right ventricle is identified by the presence of a muscle tissue that traverses it horizontally near the apex (ie, moderator band) and by the tricuspid valve, which is situated more apically than the mitral valve at its attachment to the crux of the heart. Also, the tricuspid valve has multiple papillary muscle attachments to the septum (unlike the mitral valve, which has none) and is separated from the pulmonary valve by the muscular band of tissue called the crista supraventricularis or conus. The broad triangular shape of the right atrial appendage assists identification of the right atrium because it is different from the narrow, fingerlike left atrial appendage. In the nomenclature advocated by Van Praagh in 1989, this form of transposition has been designated S,L,L. The S stands for atrial situs solitus, indicating that the morphologic right atrium lies to the right of the morphologic left atrium. The first L is for an L-looped right ventricle or a right ventricle with a left-hand pattern of internal organization. During the process of development in a normal heart, the right ventricle comes to lie on the right side so it undergoes a dextro-loop (ie, d-loop). A d-loop ventricle is one in which the internal pattern of the right ventricle conforms to a right-hand pattern, in which an extended thumb indicates the attachment to the tricuspid valve and in which the fingers indicate the right ventricular outflow tract when the palm is placed on the septal surface. The second L stands for the position of the aortic valve, which is anterior and to the left of the pulmonic valve. Pathophysiology is determined by the presence and type of associated lesions. When no other defects are present, the path of the blood flow is physiologic; blood from the left atrium enters the right ventricle and is then directed into the aorta, and, on the right side, the deoxygenated blood from the vena cava enters the left ventricle. Because of the ventriculoarterial discordance, the deoxygenated blood is then directed into the pulmonary artery. Thus, the oxygen saturations in the heart chambers and in the great arteries are normal. The most common anatomic associations include the presence of a ventricular septal defect (VSD), which may be observed in almost 80% of cases and the presence of pulmonary stenosis, which has been reported in approximately 50% of cases. [14, 3] The presence of a VSD causes a systemic-to-pulmonary shunt; however, this is usually balanced because of the protective effect of coexisting pulmonic stenosis. As with almost all forms of congenital heart disease, the causes are thought to be multifactorial. Most of the clinical and surgical retrospective studies have reported a male predominance in corrected transposition. [15, 14] One study suggested an autosomal recessive mechanism of transmission may be present in some families. Interestingly, they found that transposition of the great arteries was the most common recurrent defect in families with congenitally corrected transposition, suggesting a pathogenetic link between these 2 entities. Patients with isolated corrected transposition of the great arteries may present in adulthood because of abnormal radiography or ECG findings and may have no symptoms, at least for the first 3 or 4 decades of life. See the image below. 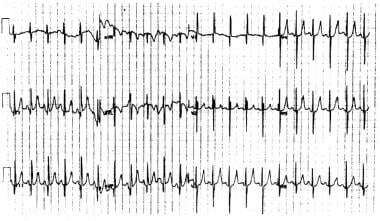 A 12-lead ECG demonstrating the characteristic features of corrected transposition Q waves in III, in aVF, and in the right precordial leads. In a study of 18 patients, Presbitero et al found that rhythm disturbances and tricuspid regurgitation were present more frequently after the third decade of life. They found that this and impaired right ventricular function developed in 66% of patients older than 50 years, causing congestive cardiac failure. A multi-institutional study confirmed that congestive cardiac failure is common in patients with or without associated cardiac defects. By age 45 years, 67% of patients with associated anomalies and 25% of patients without associated anomalies were in congestive cardiac failure. Another large study by Rutledge et al confirmed that survival rates are reduced in these patients. They found poor right ventricular function and complete AV canal as risk factors for mortality. Risk factors for progressive right ventricular dysfunction included conventional biventricular repair, complete AV block, and severe tricuspid regurgitation. Most patients who have associated anomalies present in infancy with a murmur or heart failure. Patients with bradycardia secondary to complete AV block can present at any age. Unless these patients have pulmonary atresia or severe pulmonic stenosis, cyanosis is not present. An important physical finding is the presence of a loud single second heart sound along the upper left sternal border. Patients with corrected transposition and no other associated abnormalities may not require treatment because their life expectancy has been reported to be near normal. [23, 24] However, no clear consensus has been reached regarding this group of patients at this time. At the other end of the spectrum, a double-switch procedure, as described below, would be contraindicated in patients with severe hypoplasia of either ventricle. These patients should be considered for a Fontan-type repair. Bjarke BB, Kidd BS. Congenitally corrected transposition of the great arteries. A clinical study of 101 cases. Acta Paediatr Scand. 1976 Mar. 65(2):153-60. [Medline]. Fontana RS, Edwards JE. Frequency of occurence of various anatomic types of malformations among patients with congenital heart disease. Congenital Cardiac Disease-A Review of 357 cases studied Pathologically. 1962. 28-65. Losekoot TG, Anderson RH, Becker AE, et al. Congenitally Corrected Transposition. Edinburgh: Churchill Livingstone; 1983. Lochte EH. Ein fall von situs viscerum irregularis, nebst einum beitrag zur lehre von der transposition der arterieller grosser gefasstamme des herzens. Beitrage Pathol Anat. 1898. 24:187-222. Bove EL. Congenital heart surgery. Curr Opin Cardiol. 1990 Feb. 5(1):45-51. [Medline]. de Leval MR, Bastos P, Stark J, et al. Surgical technique to reduce the risks of heart block following closure of ventricular septal defect in atrioventricular discordance. J Thorac Cardiovasc Surg. 1979 Oct. 78(4):515-26. [Medline]. Thiene G, Nava A, Rossi L. The conduction system in corrected transposition with situs inversus. Eur J Cardiol. 1977 Sep-Oct. 6(1):57-70. [Medline]. Shin'oka T, Kurosawa H, Imai Y, et al. Outcomes of definitive surgical repair for congenitally corrected transposition of the great arteries or double outlet right ventricle with discordant atrioventricular connections: risk analyses in 189 patients. J Thorac Cardiovasc Surg. 2007 May. 133(5):1318-28, 1328.e1-4. [Medline]. Anderson RH, Becker AE. Coronary arterial patterns: a guide to identification of congenital heart disease. Paediatric Cardiology. Edinburgh: Churchill Livingstone; 1981. 251-62. Van Praagh R. What is congenitally corrected transposition?. N Engl J Med. 1970 May 7. 282(19):1097-8. [Medline]. Lundstrom U, Bull C, Wyse RK, Somerville J. The natural and "unnatural" history of congenitally corrected transposition. Am J Cardiol. 1990 May 15. 65(18):1222-9. [Medline]. Van Praagh R, Weinberg PM, Smith SD, et al. Malpositions of the heart. Adams FH, Emmanoulides GC, Riemenschneider TA, eds. Moss’ Heart Disease in Infants, Children and Adolescents. Baltimore, Md: Lippincott Williams & Wilkins; 1989: 530-80. Van Praagh R, Papagiannis J, Grunenfelder J, Bartram U, Martanovic P. Pathologic anatomy of corrected transposition of the great arteries: medical and surgical implications. Am Heart J. 1998 May. 135(5 Pt 1):772-85. [Medline]. Allwork SP, Bentall HH, Becker AE, et al. Congenitally corrected transposition of the great arteries: morphologic study of 32 cases. Am J Cardiol. 1976 Dec. 38(7):910-23. [Medline]. Ellis K, Morgan BC, Blumenthal S, Anderson DH. Congenitally corrected transposition of the great vessels. Radiology. 1962. 79:35-50. Huhta JC, Danielson GK, Ritter DG, Illstrup DM. Survival in atrioventricular discordance. Pediatr Cardiol. 1985. 6(2):57-60. [Medline]. Daliento L, Corrado D, Buja G, et al. Rhythm and conduction disturbances in isolated, congenitally corrected transposition of the great arteries. Am J Cardiol. 1986 Aug 1. 58(3):314-8. [Medline]. Connelly MS, Liu PP, Williams WG, et al. Congenitally corrected transposition of the great arteries in the adult: functional status and complications. J Am Coll Cardiol. 1996 Apr. 27(5):1238-43. [Medline]. Piacentini G, Digilio MC, Capolino R, et al. Familial recurrence of heart defects in subjects with congenitally corrected transposition of the great arteries. Am J Med Genet A. 2005. 137(2):176-180. [Medline]. Presbitero P, Somerville J, Rabajoli F, et al. Corrected transposition of the great arteries without associated defects in adult patients: clinical profile and follow up. Br Heart J. 1995 Jul. 74(1):57-9. [Medline]. Graham TP, Bernard YD, Mellen BG, et al. Long-Term outcome in congenitally corrected transposition of the great arteries: a multi-institutional study. J Am Coll Cardiol. 2000. 36(1):255-261. [Medline]. Rutledge JM, Nihill MR, Fraser CD, et al. Outcome of 121 patients with congenitally corrected transposition ofthe great arteries. Pediatr Cardiol. 2002 Mar-Apr. 23(2):137-145. [Medline]. Dimas AP, Moodie DS, Sterba R, Gill CC. Long-term function of the morphologic right ventricle in adult patients with corrected transposition of the great arteries. Am Heart J. 1989 Sep. 118(3):526-30. [Medline]. Ikeda U, Furuse M, Suzuki O, et al. Long-term survival in aged patients with corrected transposition of the great arteries. Chest. 1992 May. 101(5):1382-5. [Medline]. Mullins CE. The Science and Practice of Pediatric Cardiology. 2nd ed. Baltimore, Md: Lippincott Williams & Wilkins; 1998. Sharland G, Tingay R, Jones A, Simpson J. Atrioventricular and ventriculoarterial discordance (congenitally corrected transposition of the great arteries): echocardiographic features, associations, and outcome in 34 fetuses. Heart. 2005 Nov. 91(11):1453-8. [Medline]. [Guideline] Gregoratos G, Cheitlin MD, Conill A, et al. ACC/AHA guidelines for implantation of cardiac pacemakers and antiarrhythmia devices: a report of the American College of Cardiology/American Heart Association Task Force on Practice Guidelines (Committee on Pacemaker Implantation). J Am Coll Cardiol. 1998 Apr. 31(5):1175-209. [Medline]. Fischbach PS. Congenitally corrected L-transposition of the great arteries: abnormalities of atrioventricular conduction. Prog Ped Cardiol. 1999. 10:37-43. Devaney EJ, Charpie JR, Ohye RG, Bove EL. Combined arterial switch and Senning operation for congenitally corrected transposition of the great arteries: patient selection and intermediate results. J Thorac Cardiovasc Surg. 2003 Mar. 125(3):500-7. [Medline]. Russo P, Danielson GK, Driscoll DJ. Transaortic closure of ventricular septal defect in patients with corrected transposition with pulmonary stenosis or atresia. Circulation. 1987 Sep. 76(3 Pt 2):III88-92. [Medline]. Ilbawi MN, DeLeon SY, Backer CL, et al. An alternative approach to the surgical management of physiologically corrected transposition with ventricular septal defect and pulmonary stenosis or atresia. J Thorac Cardiovasc Surg. 1990 Sep. 100(3):410-5. [Medline]. Yamagishi M, Imai Y, Hoshino S, et al. Anatomic correction of atrioventricular discordance. J Thorac Cardiovasc Surg. 1993 Jun. 105(6):1067-76. [Medline]. Sojak V, Kuipers I, Koolbergen D, et al. Mid-term results of bidirectional cavopulmonary anastomosis and hemi-Mustard procedure in anatomical correction of congenitally corrected transposition of the great arteries. Eur J Cardiothorac Surg. 2012 Oct. 42(4):680-4. [Medline]. Mavroudis C, Backer CL, Kohr LM, et al. Bidirectional Glenn shunt in association with congenital heart repairs: the 1(1/2) ventricular repair. Ann Thorac Surg. 1999 Sep. 68(3):976-81; discussion 982. [Medline]. Benson LN, Burns R, Schwaiger M, et al. Radionuclide angiographic evaluation of ventricular function in isolated congenitally corrected transposition of the great arteries. Am J Cardiol. 1986 Aug 1. 58(3):319-24. [Medline]. Winter MM, van der Plas MN, Bouma BJ, Groenink M, Bresser P, Mulder BJ. Mechanisms for cardiac output augmentation in patients with a systemic right ventricle. Int J Cardiol. 2009 Feb 22. [Medline]. Warnes CA. Transposition of the great arteries. Circulation. 2006 Dec 12. 114(24):2699-709. [Medline]. Scherptong RW, Vliegen HW, Winter MM, et al. Tricuspid valve surgery in adults with a dysfunctional systemic right ventricle: repair or replace?. Circulation. 2009 Mar 24. 119(11):1467-72. [Medline]. Mongeon FP, Connolly HM, Dearani JA, Li Z, Warnes CA. Congenitally corrected transposition of the great arteries ventricular function at the time of systemic atrioventricular valve replacement predicts long-term ventricular function. J Am Coll Cardiol. 2011 May 17. 57(20):2008-17. [Medline]. Szufladowicz M, Horvath P, de Leval M, et al. Intracardiac repair of lesions associated with atrioventricular discordance. Eur J Cardiothorac Surg. 1996. 10(6):443-8. [Medline]. McKay R, Anderson RH, Smith A. The coronary arteries in hearts with discordant atrioventricular connections. J Thorac Cardiovasc Surg. 1996 May. 111(5):988-97. [Medline]. Westerman GR, Lang P, Castaneda AR, Norwood WI. Corrected transposition and repair of associated intracardiac defects. Circulation. 1982 Aug. 66(2 Pt 2):I197-202. [Medline]. Alghamdi AA, McCrindle BW, Van Arsdell GS. Physiologic versus anatomic repair of congenitally corrected transposition of the great arteries: meta-analysis of individual patient data. Ann Thorac Surg. 2006 Apr. 81(4):1529-35. [Medline]. Hoashi T, Kagisaki K, Miyazaki A, Kurosaki K, Shiraishi I, Yagihara T, et al. Anatomic repair for corrected transposition with left ventricular outflow tract obstruction. Ann Thorac Surg. 2013 Aug. 96(2):611-20. [Medline]. Langley SM, Winlaw DS, Stumper O, et al. Midterm results after restoration of the morphologically left ventricle to the systemic circulation in patients with congenitally corrected transposition of the great arteries. J Thorac Cardiovasc Surg. 2003 Jun. 125(6):1229-41. [Medline]. Imamura M, Drummond-Webb JJ, Murphy DJ, et al. Results of the double switch operation in the current era. Ann Thorac Surg. 2000 Jul. 70(1):100-5. [Medline]. Mandell AJ, Russo PV, Blomgren BW. Geometric universality in brain allosteric protein dynamics: complex hydrophobic transformation predicts mutual recognition by polypeptides and proteins. Ann N Y Acad Sci. 1987. 504:88-117. [Medline]. An anteroposterior chest radiograph revealing the straightened left heart border formed by the aorta, which is more leftward and anterior than usual. A transthoracic echocardiogram in the apical 4-chamber view illustrating the moderator band in the left-sided ventricle and the apically displaced left atrioventricular valve suggesting that it is the morphologic right ventricle. A transthoracic echocardiogram in the parasternal short axis view demonstrating the anterior and leftward aorta. The left coronary artery can be observed at the 10-o'clock position.